Shortly after I descended from the smoggy heights of Kuala Lumpur’s iconic Petronas Towers, I made my way to the dross-sounding, Malaysia National Museum (Muzium Negara). I say dross, because I often discover that museums dedicated to national identity, have that rare ability to hypnotise me with officialised blandness. Malaysia’s is no different, but I was left with a residual sense of obscurity, which I neither expected nor welcomed. From the outside, the Malaysia National Museum is a rather stale example of Malay architecture, which has been bastardised by concrete and a fashion of orderly. Its main exhibitions are adequately informative (a consistent theme through Malaysia’s many museums), but you do leave feeling a little, flat. Unless perhaps you’re Malaysian, which grants you an obligatory devotion to your country’s undulating history. You should, I assume, have a patriotic knowledge of the many black-and-white heroes displayed in the foyer, and have an unnatural obsession for archaeology. I jest of course, for Malaysia is a country that has been twisted and torn by empires of old and new. A burning tinge of communist suppression, and a trifle too much European colonialism undermine a country which has succeeded, more than most, in achieving that holy grail of societal style: multiculturalism. The current government is fervently promoting their 1Malaysia campaign, extolling the many virtues of accepting multiculturalism at every level. Politics aside, it makes an interesting topic of conversation, with the overriding reaction from (mostly Malay) people I spoke to, being that they “Don’t need to be told to be multicultural,” because in their eyes they have been their entire lives. As I pondered this thought, I leaned against a balcony in the heart of the museum, and watched with interest, the way domestic tourists avoided observing the exhibitions. It was a blend of sideways glances and subtle quicksteps, as they floated effortlessly passed neat rows of glass cabinets. It appeared the act of visiting this museum, was an inconvenient necessity. The irony for me, was that those visitors skimming passed Muzium Negara’s exhibitions, soon become the most interesting exhibit. This illusion isn’t exclusively a Malaysian speciality; as I said in my opening, national museums very rarely enthral me. The other reason I am so fluidly undermining the part this museum has in the landscape of Malaysia was found in a corner of the museum grounds, where I — quite literally — discovered one of my pet hates. The room was small, but pocked with odorous glass tanks filled with creatures from around the globe. “Is that an Australian wallaby?” I asked one of the spindly young Russians who was eyeing me and my dormant camera with disdain from across the room. “I think from New Zealand,” he buzzed. I instantly disliked everyone in the room. My imagination went into overdrive, and I concocted a story whereby this Russian and his pale friend had smuggled the wallaby out of New Zealand on an iron ark. Perhaps after a ferocious storm, they washed ashore in Kuala Lumpur, where they were forced by the Mafia to take a job in the National Museum’s pet store (until such time as they could pay for their next mission). I circled the room, and spotted a pair of hedgehogs huddled into the corner of a glass tank, no larger than thirty centimetres cubed. They were curled up in a ball, with neither a place to snuffle, nor play. Stuck to the glass above their prickles, a handwritten sticker displayed their worth: RM180 (£36). If I were a hedgehog, I think I would be quite proud of this valuation, although I presumed the nearby Asian forest scorpions may have been a little put out by their own meagre RM25 (£5) price tags. The occupants of neighbouring confines spent their days in silent contemplation; minute frogs and spindly snakes, hairy-limbed spiders, puppies and perhaps the biggest surprise of all, a pair of stowaway skunks. If you have not already realised it from reading TrailofAnts.com throughout the years, I’m not a fan of needless animal cruelty. I accept that animals will be bought and sold, but see little reason in their unnatural confinement. Many of you know, I do not visit zoos or aquariums for this very reason. Once again, I accept that some zoos may contribute a nominal amount of their time and profit to conservation and preservation, but when I think about that elephant schlepping around his central London enclosure, or any of the world’s amazing animal kingdom, being taunted by podgy children, I find little reason for cheer. The world’s a fine enough zoo, without boxing everything up. I’ll taper off the subject, as my intention is to portray, not preach. Much. I often make hypocritical mistakes with my standpoint, and the next exhibition was a good example of this. Titled ‘Snake vs. Snake’, I had wrongly presumed the exhibition was a series of photographs portraying battles between anacondas and pythons, or perhaps what might happen when rival cobras encounter each other in the wild. Seconds after I paid the RM8 (£1.60) entrance fee, I was smiled at by an attractive young Malaysian woman. She was dressed in tight, funky clothing and would not have looked out of place in an X Factor audition. Only, Azha wasn’t auditioning for anything, because in her eyes she was already the star of the show. 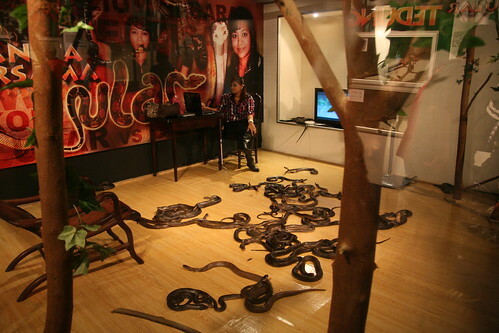 Enclosed within a sizeable room, with glass walls on two sides and a laminate floor, Azha the Snake Queen flicked her gaze between a plasma TV screening Malay pop, and her laptop. Strewn across the floor were three dozen or more cobras. I watched Asha for twenty minutes, as she intermittently dragged the snakes around with a large hook, before returning to her seat. I concentrated my mind, and with all my might, I willed the cobras to rise up against her in an act of reptilian rebellion. Alas, they just slumped there; like scribbles, on the footnote of greatness. My discomfort at having paid to see this was severely accelerated when I saw the rest of the exhibition, and discovered snakes of every size squished into tanks barely large enough to hold their lunch, let alone the snakes themselves. To accentuate the lack of consideration for the snakes, the overriding theme of the exhibition was that snakes are terrible, and at worst they are humankind’s most feared enemy. This was echoed by the large screen showing the nastiest clips from films such as Snakes on a Plane, Boa vs. Python and Anacondas. As I left the room, I watched a large Muslim family stretch out a large golden python for a family photo. I saw how happy the children were; and a glint of fear in the mother’s face, absorbed by the outward pride of the children’s beaming father. I considered what that moment must have meant to them, and how that photograph would be pointed out with vigour in the family album for many years to come. For a moment, I accepted it as a part of life. Then I considered how the snake felt, and wondered if it would ever be invited into the 1Malaysia equation. Have you ever been incensed by the treatment of animals abroad? There are countless stories of exploitation of animals for money, far worse than the example I have cited today. Perhaps you have a suggestion of how things can be change, or you can see an opportunity for compromise? Share your feelings with others, via the discussion thread below. You’ve hit upon the Asia / African …. okay (make it easier) non European decent countries vs of European decent. And, there treatment of animals. And, I agree with you. Nothing worse than seeing some idiot leave his dog chained up in a yard for it’s entire life. And then claim to love it. Sure he does.But, it’s not a good love. Ditto for these animal sideshows. Worst was in Ghana whereby the local kids would throw stones at chimps in a cage. I threw stones back at them and ask how they liked it. I hope the memory stays with them. I applaud your reaction, Dave. Makes me wish I’d snatched that hook of the Snake Queen and started prodding and pulling her about. I think one of my most frustrating experiences was in Sri Lanka; I took an hour long journey to go and meet a man who supposedly developed anti-venoms for snakebites. Only, when I got there I found most of the snakes were constrictors (therefore hardly venomous, if at all) and he would take great happiness in taunting the vipers, so they would strike at him. Only, they were behind a wire meshing so their ‘noses’ would be bloodied by the impact. The strange thing was, this man was proud of something else; his inclusion in the Lonely Planet Sri Lanka guide! Hmm.. This is really interesting and something I have been thinking about for a while now. Traveling in Europe even has been an eye-opener for me. People love their dogs but they don’t keep them clean or feed them properly, in my opinion anyway. The animals never go in the house either because they are ‘dirty’. Yes, they are – that’s why you have to clean them! I was taken aback at how filthy most dogs were in Europe but I did notice they were loved dearly. It’s just very different than how I think things should be. I tried my best just to give extra love to the really dirty ones. However when I showed people pictures of my dog in his little striped shirt – they thought I was insane! I can’t handle animal cruelty of any sort and even though I applaud good zoo’s for helping animals (especially the ones that can’t be released) I still tear up when I see the gorillas. No arguments here, Bethany. It’s an international problem, which is often exhausting to open discussion on. I hear stories all the time of individuals or small organisations doing things to help clear strays off the street (like this recent Malaysian example) but until the critical mass is educated about the need (for their own health) to look after domestic animals and livestock in a satisfactory manner, then the problem will continue. I’m not an activist, but travelling in Asia really opened my eyes to the lowly position most of the population of that continent perceives animals to be. It triggered my girlfriend, Reb to turn vegetarian, and for many months I did also. I’m not saying the people of Asia are consciously negligent, but the issue does appear to be the proverbial, “Elephant in the Room” for visiting tourists (pun intended). I’ve heard of other locales of ball pontyhs that get larger than your typical domestic ball python, but they are not available in the pet trade for some reason. The only ball pontyhs available are pretty much the same except for the genetic abnormalities that occur in the many morphs that are on the market. I am also commenting to make you understand what a great encounter our child had browsing your site. She came to understand several details, with the inclusion of how it is like to have an excellent giving style to get certain people clearly know precisely several problematic subject areas. You undoubtedly did more than our expected results. Many thanks for imparting these great, trusted, educational and also easy tips about that topic to Mary. Thank you a lot for providing individuals with such a brilliant chance to read from this site. It really is so great and full of amusement for me and my office mates to search your website really thrice in one week to learn the fresh guidance you will have. And of course, I am just actually satisfied with your splendid pointers you serve. Selected 2 areas in this post are unquestionably the simplest I’ve ever had. for enjoyment, as this this website conations in fact pleasant funny material too. I wish to express appreciation to this writer for bailing me out of this type of predicament. Because of researching throughout the the net and meeting ways that were not beneficial, I believed my entire life was over. Being alive devoid of the solutions to the difficulties you have fixed as a result of your entire post is a crucial case, and the kind which could have in a wrong way affected my entire career if I had not encountered the website. Your personal skills and kindness in playing with almost everything was very useful. I am not sure what I would have done if I hadn’t encountered such a solution like this. I can at this time look forward to my future. Thank you so much for your skilled and amazing help. I won’t hesitate to propose your web blog to any individual who should have tips on this issue. I intended to compose you the very little note so as to say thanks again relating to the precious opinions you’ve discussed above. This is certainly seriously generous with you in giving easily exactly what a number of people might have offered for sale for an e book to make some dough for their own end, mostly now that you might well have done it if you wanted. The guidelines as well worked like a good way to fully grasp someone else have the identical interest similar to my very own to find out good deal more on the subject of this issue. Certainly there are a lot more enjoyable times up front for those who looked over your site. Thanks so much for providing individuals with an extremely pleasant opportunity to read in detail from this website. It’s always very pleasurable and also packed with fun for me and my office peers to visit your blog at least thrice in one week to study the new issues you will have. And definitely, we’re always fascinated with your surprising techniques you give. Certain two ideas in this posting are unquestionably the most beneficial we have ever had. I would like to express appreciation to the writer for rescuing me from this particular setting. After looking through the world wide web and finding ways which were not productive, I believed my entire life was done. Existing without the presence of solutions to the difficulties you have resolved by means of your short post is a critical case, as well as ones that would have badly affected my entire career if I had not come across your blog. The natural talent and kindness in touching all the pieces was vital. I don’t know what I would have done if I had not discovered such a subject like this. I can at this point relish my future. Thanks a lot very much for your high quality and effective help. I won’t be reluctant to refer your web sites to any individual who would like assistance about this area. Thanks so much for providing individuals with such a wonderful chance to read articles and blog posts from this web site. It is often very brilliant and as well , packed with a lot of fun for me and my office fellow workers to visit your website at the very least 3 times weekly to find out the newest guides you will have. And lastly, I am just certainly fulfilled concerning the dazzling ideas you serve. Certain 4 tips in this post are in truth the most effective we’ve ever had. I wish to get across my appreciation for your kindness giving support to all those that should have assistance with this one area of interest. Your very own dedication to passing the message all-around turned out to be pretty practical and has specifically encouraged ladies like me to arrive at their aims. Your personal valuable help and advice implies a great deal a person like me and a whole lot more to my mates. Regards; from all of us. I wish to express some thanks to this writer for bailing me out of this type of trouble. As a result of looking out through the online world and finding principles that were not pleasant, I thought my entire life was over. Living minus the strategies to the issues you have fixed as a result of this site is a serious case, as well as the kind which may have adversely affected my career if I hadn’t come across your blog post. Your main mastery and kindness in handling a lot of stuff was vital. I am not sure what I would’ve done if I hadn’t discovered such a point like this. It’s possible to now relish my future. Thanks a lot very much for this professional and sensible help. I will not think twice to refer your web site to any individual who needs counselling on this subject.